8000 - BRIGHT High G set - Double Length, Cut into 2 sets! 4th High G Carbon .023"
Great strings, feel nice on the fingertips. Nice sound, bright yet not harsh. The best uke strings I have played. Oasis strings sound and feel amazing on my ukuleles. I have used the bright and warm sets, and they both sound superb. They chime, sustain, and have a nice little punch without losing their subtle nature with quiet finger picking. Having enough fluorocarbon for two sets per pack is a great bonus, but I would pay the price for for just one set. The price is outstanding for what you receive. The only con is these strings stretch for what seems like forever. Even longer than the Martin strings. However, that is a small gripe compared to the sound and feel Oasis strings provide. 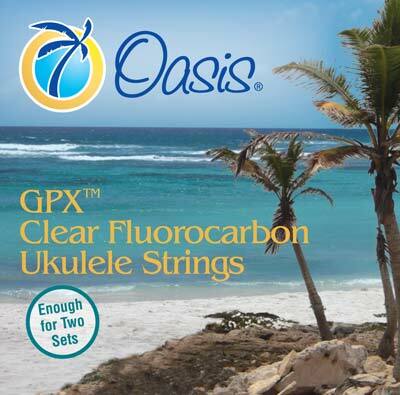 Really like the Oasis GPX Clear Fluorocarbon (bright high G) strings I bought from you for my Favilla soprano ukulele. Great sound! Also appreciate the quick delivery. I’ve used Oasis strings on soprano, concert and tenor ukuleles. These brights have a lively sound, settle in quickly and feel very secure under the fingers. Considering you get two sets in each pack, this is a fine deal. Thank you for your prompt service and handwritten note. Great customer service.enjoy the Holidays. PS. He loves the Uke strings.